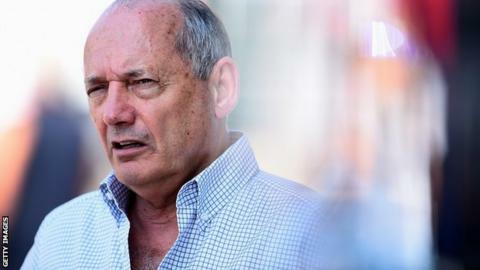 The tensions between title rivals Lewis Hamilton and Nico Rosberg could result in one of them leaving Mercedes at the end of this season, Ron Dennis says. McLaren's chairman, who says his team are some way from finalising their own driver line-up, has experienced similar battles between team-mates in the past. "No-one could have predicted the tension within Mercedes-Benz," he said. "We can imagine a range of scenarios that could see one of their drivers on the market by the end of the year." Hamilton, 29, and current championship leader Rosberg, who go into Sunday's Italian Grand Prix separated by 29 points, collided at the Belgian GP two weeks ago. They have since been warned by Mercedes boss Toto Wolff that the team would have to consider changing their driver line-up "if we are not able to manage the two of them following the Mercedes-Benz racing spirit". Rosberg has recently extended his contract for a further two years, with an option for more, while Hamilton has another year on his to run and is keen to extend it. Dennis said that if Hamilton or Rosberg, 29, were to become available "that does not mean we would automatically reach for that driver, or any other driver, in preference to what we have". He refused to confirm McLaren's interest in Fernando Alonso, or comment on the admiration he expressed at the beginning of the season for Red Bull's Sebastian Vettel. Both scenarios mean the futures of the current McLaren drivers, Britain's Jenson Button, 34, and Denmark's Kevin Magnussen, 21, are in doubt. Dennis said: "You can go back and see it constantly repeated over the years; we always have the best available drivers. "So the first thing you have to establish - and it is not at all derogatory, detrimental or negative to your existing drivers - is who is available." He said the team's change to Honda engines next year meant keeping the same drivers could be appealing. "That's because stability, as we go into the relationship with Honda, and in-depth understanding of the entire plan, has a huge value, and loyalty is very important to me too," Dennis said. Dennis said McLaren's decision "won't be in the next few days, and it won't be at the end of the season, it will be something in between". Both Mercedes drivers are under contract for 2015. Hamilton's deal runs out at the end of next season, and Rosberg has extended his until at least the end of 2016. Red Bull team boss Christian Horner said he expected all the top teams would keep the same driver line-up in 2015. "I'd be surprised if there was any movement," Horner said.